Marble tablet above the entrance to the tomb of the Valerii. 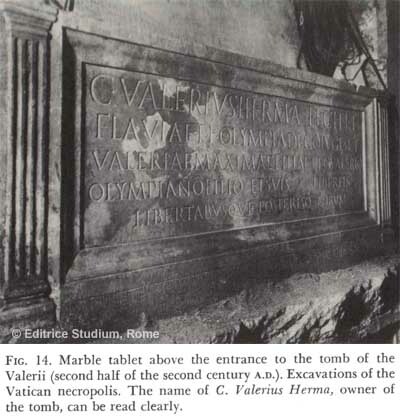 The name C. Valerius Herma, owner of the tomb, can be read clearly. The largest mausoleum of the whole series, H, with its forecourt H1, is the family-tomb of the Valerii. Writing-materials are rendered in stucco above the heads of two of the family-portraits in the Tomb of the Valerii. We cannot tell whether this means that these people were professional writers and men of letters, or that they merely devoted their leisure-moments to literary pursuits. Inscriptions throw some light upon the arrangements sometimes made with regard to the ownership of tombs or of individual burial-sites inside them. 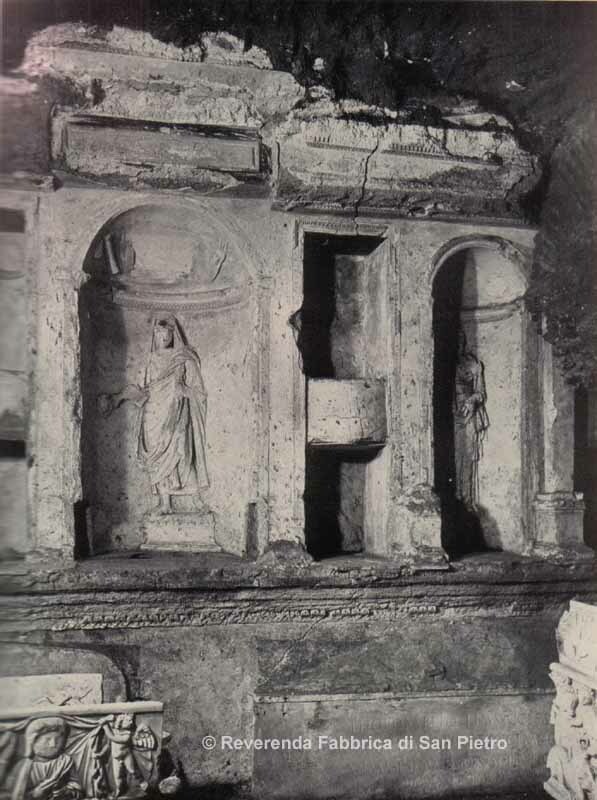 In the Tomb of the Valerii, Valerius Philumenus and Valeria Galatia gave Titus Pompeius Successus a locus in the tomb in which he might bury his son and their friend, the free-born Titus Pompeius Successus junior. Subsequent restorations undertaken in the Tomb of the Valerii brought further inscriptions to light. These inscriptions record, among others, Aurelia Charite and her father Aurelius Psittacus; Aurelius Helius and his wife Satria Ianuaria; and Flavius Statilius Olympius, a Christian, whose delightfully illiterate epitaph incorporates the Chi-Rho monogram. The inscription recording Flavius Diodorus and his wife Selenia Berenice, previously known only in a fragmentary state, is now complete; the phrase comparaverunt libertis libertabusque posterisque eorum, which it contains, may refer to the purchase either of a whole tomb or of a burial-site within a tomb. A second inscription of Flavius Diodorus and Selenia Berenice records their infant grandson Flavius Velenius Diodorus, and alludes to the purchase mentioned in the first inscription. Corresponding to this variety of ideas about life beyond the tomb there is a veriety of religious currents which met and mingled at this time. This variety is well demonstrated in the plaster ornaments in the tomb of the Valerii. There, beside Minerva, the wise goddess of Olympus, can be seen Isis, Apollo Harpocrates and Jupiter Dolichenus, three exotic divinities very dear to the Romans of the imperial period; while satyrs and maenads proclaim, with their frenzied dances, the invincible power of that Dionysus-Bacchus whom the pagan society of the time considered a symbol of supreme happiness in earthly life and also in the future world. It might even be said that the religion of Dionysus predominates in this silent city of the dead. 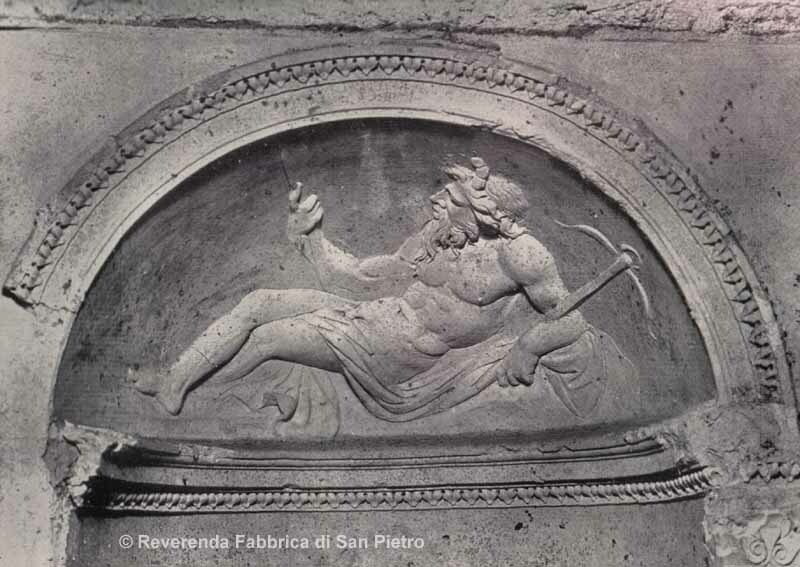 The young Dionysus, with his cortege of satyrs and maenads, his panthers and his thrysus and his festive, heavily-loaded bunches of grapes, seems to promise, from the walls of tombs and from the carvings on marble saracophagi, the end of troubles in an eternal happy drunkenness. VATICAN CITY, MAY 27, 2008 (Zenit.org).- One of the most important monuments of the Roman necropolis located under the Vatican Basilica is restored and ready for viewing. During a press conference today, Cardinal Angelo Comastri, archpriest of the Basilica of St. Peter's, presented the results of the recently-completed restoration of the Valerii Mausoleum. The crypt, which dates from the second century and is famous for its stucco decorations, is located in the middle of the route through the old necropolis that leads to the tomb of St. Peter. The stuccowork was in need of restoration because it had been damaged by the instability of the microclimate in the necropolis and by earlier restoration using inappropriate materials. The 10-month operation was carried out using scalpels, mini drills and, for the most delicate areas, laser equipment. Furthermore, by studying stucco fragments conserved in the storerooms of the Fabric of St. Peter's, it was also possible to recompose three hermae, square pillars of stone topped by a bust or head. Finally, the monument was enclosed within a glass cover, so it may be viewed without affecting the delicate balance of the internal microclimate, which is constantly monitored by a high-precision computerized system. New illumination, using fiber optic cables, makes it possible to admire the colored surfaces, frescoed to imitate polychrome marble, and the white stucco decorations, modeled to replicate marble statues.